Mr. Ominsky is a seasoned litigator and former in-house counsel to a Fortune 100 company. He knows what to expect when heading into the courtroom and appropriately prepares clients. Often, we are able to keep clients from having to go to court because we effectively negotiate a fair settlement. As a results-oriented practice, we are always looking for ways to reach the best possible outcome with the least possible impact on our clients' time and resources. Our clients come to us with stresses that affect their financial, personal and business well-being. Often, they find that while working and partnering with the Law Offices of Marc A. Ominsky, they can release those stresses and have confidence that the experienced attorneys handling these matters will give them piece of mind. To be successful, we must understand our clients' circumstances and expectations. 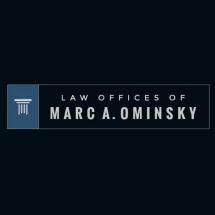 When you partner with the Law Offices of Marc A. Ominsky rest assured you have an experienced, relentless team in your corner. The Law Offices of Marc A. Ominsky is a debt relief agency. We help people file for bankruptcy protection under the U.S. Bankruptcy Code.